Antalgic gait is something that you may have done, but not even realized it. It’s a major change in your walk due to pain. But is that all that it is? What is antalgic gait? What are the causes of antalgic gait? Is there any way to treat it or are you stuck walking like that forever? 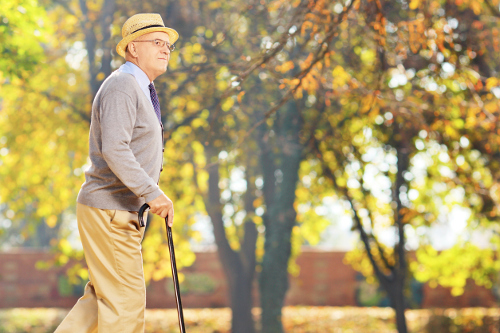 In this article, we’ll take a look at all of the basics of antalgic gait. We will cover what antalgic gait is, what causes it, and how it is diagnosed and treated. By the time you are done reading this piece, you will have a basic knowledge of antalgic gait, as well as how you can treat it and get your walk and life back on track. In its simplest definition, antalgic gait is limping due to pain. It’s a major change to the gait of your walk to avoid pain. One of the legs and feet will be absorbing most of the impact of walking, trying to keep that impact away from the pain areas as much as possible. In some severe cases of antalgic gait, the foot that is part of the pain area will barely touch the ground. As you can see, there’s a good chance you’ve suffered from antalgic gait once or twice in your life to varying degrees. But, what causes antalgic gait? What Are the Causes of Antalgic Gait? As you may have guessed by our description of antalgic gait, it can be the result of any number of different sources. The one main thing that these sources have in common is that no matter what, the main cause of antalgic gait is pain and the avoidance of it. With that in mind, the following are common causes of antalgic gait. The most common of all the causes of antalgic gait, injuries to the leg and connected areas can easily cause you to walk with an antalgic gait. From torn leg muscles to a cracked hip, the injury can cause enough pain that you will begin to walk with a limp. Deformities in the leg, joints, feet, and hips can cause your gait to change significantly. These defects can be with the sufferer at birth, or something developed later due to injury. Arthritis, especially in the joints, can cause pain from the pressure and weight on the affected joints. In these cases, the antalgic gait may be temporary if the arthritis pain comes and goes. Inflammation and infection of the leg, hip bones, and joints can become very painful and avoided while walking. Tumors, both cancerous and not, can grow in a place that affects leg and or foot movement, which can create antalgic gait. There are also some very temporary causes of antalgic gait like muscle strains, and ankle and knee sprains. None of these causes are particularly comfortable, and all affect your walking and possibly your day-to-day life. Much like the definition of antalgic gait, the symptoms of antalgic gait are pretty simple and easy to define. Now, this does not include the other symptoms that might be a part of the cause of the antalgic gait in the first place (tumors, inflammation, infection, and other such causes). With all of the symptoms flying around, you may be wondering how an antalgic gait can be diagnosed. How Is Antalgic Gait Diagnosed? When trying to diagnose you for antalgic gait, the doctor will take a few things into account. The doctor will ask you about your recent medical history to take in the possible reasons why your gait may have changed. After discussing your medical history, the doctor will do a physical examination to gather information on the difference and changes in the walking gait, as well as examine the extent or lack of movement within your leg. Pain levels will also be measured. For the most part, the physical aspects of antalgic gait are pretty visually evident. Once you have a diagnosis, you can begin treatment. What Are the Treatment Options for Antalgic Gait? to know is that if the cause of the antalgic gait is singled out and treated, more often than not, the antalgic gait will disappear with the issue that caused it. Beyond that, there are a few other things that can be used to help you out. The use of a device like a cane or a walker can help take the weight off the area that is causing you pain in the leg. Depending on the cause of the pain, this can help the cause of your antalgic gait to heal a little quicker. If the limping is due to a muscle issue or a sprain, then getting some rest can help. Give your leg time to heal. You may need to use an ice pack and switch off with a heating pad. Once your leg heals, you may find that your gait will return more or less to normal. Painkillers and anti-inflammatories may be prescribed, especially if the issue is joint pain and inflammation. These can help reduce pain and swelling and help your gait get back normal. We’ve all suffered from antalgic gait at one point or another. Maybe it’s because you’ve tripped, or maybe you had a bad fall. The good thing is, it may not be a permanent situation. The important thing is to take care of it. Don’t think that it will go away on its own. See a doctor to get the full scope of what’s causing the antalgic gait. And by getting proper treatment, your walk will hopefully return to normal in no time. Carrelli, B., “Antalgic Gait,” eChiropractor, May 9, 2016; https://www.echiropractor.org/antalgic-gait/, last accessed May 24, 2017. “What Can Cause Antalgic Gait and What Are Its Treatment?” ePain Assist, July 9, 2015; https://www.epainassist.com/brain/antalgic-gait, last accessed May 24, 2017. “Causes of Antalgic Gait,” Right Diagnosis, August 13, 2015; http://www.rightdiagnosis.com/a/antalgic_gait/causes.htm, last accessed May 24, 2017. “Antalgic Gait,” Dr. Foot; http://www.drfoot.co.uk/Antalgic-Gait.htm, last accessed May 24, 2017. Nirenberg, M., “Antalgic Gait – Symptoms, Causes & Treatment,” Foot Vitals, October 2, 2015; http://www.footvitals.com/health/antalgic-gait.html, last accessed May 24, 2017.